Able Glass (Family Owned & Operated Since 1969) is your local Milgard Certified Dealer. 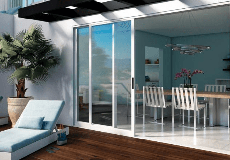 Able Glass has the experience to assure you that you get the right windows and doors for your home, or if you are a contractor/builder, for your customer. A visit to our beautiful showroom will allow you to experience why Able Glass has so many past, present, and future customers. Whether you would like to leisurely browse and operate Milgard's award winning products, learn about the latest design and energy efficiency trends, or discuss technical aspects of your project, the team at Able Glass has professionally trained window experts that are available to answer all your questions and help you find the perfect windows and doors for your home. Able Glass has the highest ratings with Diamond Certified, Consumer Checkbook, Angie's List, and Yelp. Able Glass was awarded "Best Window & Door Installer" by the San Jose Mercury News for 7 consecutive years since 2010. Hall of Fame Winner - "Best Window Installer "
Able Glass is rated 5.0 out of 5 by 38. Rated 5 out of 5 by NinaGina from Able Glass takes pride in their work and offers the best values with complete satisfaction! Able Glass did a fantastic job helping me select the best windows and patio door for my home. They took the time to explain the different window types along with the installation process for each type. They know their products well. I was very impressed on how quickly and how well their team worked together in getting the windows installed. The workmanship and quality they put into this job was outstanding. They definitely get a Thumbs Up! I will highly recommend Able Glass to my friends and family. Rated 5 out of 5 by Shirley6554 from I'm a Previous Milgard Customer Needed to replace my patio door and since all the other windows in my home are Milgard this was an easy choice. My insurance agent mentioned Able Glass, so that was good enough for me and I am very glad because they were fantastic to work with. Eric was in touch with me through the entire install and I I felt confident in the job the installers were doing. GREAT JOB ABLE GLASS. I would highly recommend this company.. Rated 5 out of 5 by pycs from Wonderful customer service and experience We had an excellent experience with Able glass. We needed windows for our new construction and not only did they come through with the best quote, when there were issues with our order (not their fault) they responded promptly to get the issues resolved at no cost to us. I would not hesitate to come back to Eric and his team with any future window needs or recommend them to others. Rated 5 out of 5 by ingrid51 from New windows and sliding door for my condo Able Glass recently replaced my windows and a sliding door. I couldn't be happier! The windows are beautiful. Eric, Leo, Miguel, and David were great to work with. There was not one speck of debris left behind after the job was done. I would recommend Able Glass to anyone. Rated 5 out of 5 by Horsedancer from Love our new windows The Able Glass crew did a wonderful job. Everyone from the owner, supervisor, and the crew were very knowledgeable, polite, and competent. We have seen much improvement with reduction of freeway noise and reducing the heat within the house since having the windows replaced. We are very pleased with our windows and the job done! Rated 5 out of 5 by justinPV from Great product, great installation Able Glass did a phenomenal job installing sliding and swinging doors in our 70 year old home--the Milgard products are a perfect fit for our home and we appreciate the high security features and good insulation, and we appreciate the high attention to detail--both finishes and engineering to fit with our home--by the Able Glass crew.